Tickwogh is a specialty camp for sailors. Sailing is also offered at our traditional camp. Our Sailing and Racing camp is the perfect program for campers who want to develop sailing skills rapidly. We are determined to teach campers the sport of sailing using fun, interactive lessons. 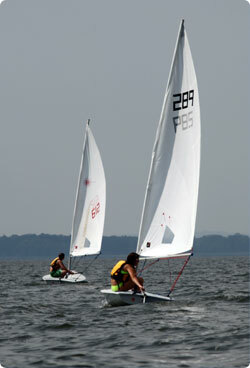 Our staff includes collegiate and international sailors who compete in sailing regattas regularly throughout the year. We want our passion for the sport of sailing to transfer to our campers so we hire people who love what they do. Our instruction is a mixture of “chalk talks,” hands-on drills, and one-on-one lessons. Mix in fun on the water games that also work on the skills, and you have the perfect recipe for youth sailing instruction. While the program may seem intensive, each session contains a fairly even mix of beginner, intermediate, and advanced sailors. We work with each camper to develop specific goals that take into account different learning needs. Having a small group (no more than 22 campers) helps the instructors zero in on individual goals. Tickwogh sailors primarily learn on Lasers. During their first week, campers learn how to master basic courses and fine-tune their techniques. In the second week, they begin to race around full courses. Campers get to experience a regatta a day as their sessions wrap up. We also have two special sailing events every summer, the Tockwogh Regatta (2nd Session) and the Echo Hill Regatta (4th Session). Both are big events with multiple fleets and provide campers with a traditional racing experience. See all dates and rates for this program. See an overview of all summer camps offered by YMCA Camp Tockwogh in Maryland.